The Hilleberg Tarp XP 10 is Hilleberg's simplest shelter solution; it is light, easy to use and remarkably versatile. Covering a large expanse of 350 x 290 cm, it's the perfect shelter for couples or solo backpackers. 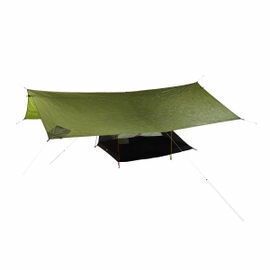 Made from Kerlon SP, the Tarp XP 10 is of course completely waterproof and is particularly durable. 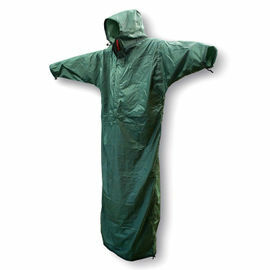 A tarp provides essential weather protection while still allowing you to feel fully 'outdoors'. And how much of that feeling you indulge in is completely up to you, since the tarp’s usage is limited only by imagination and pitching materials. While most commonly used on its own, a tarp can also add a new dimension to standard tent camping. By pitching your tarp over a tent's entrance, you can have the luxury of a 'patio' area with plenty of natural breeze. Alternatively, you can use the tarp to create a kitchen area away from your campsite for greater safety in bear country. 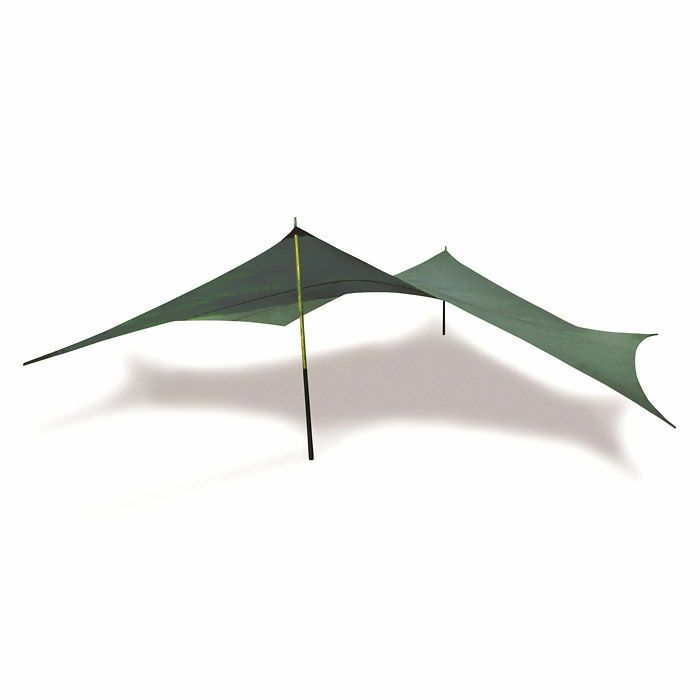 The Tarp XP 10 features reinforced attachment points complete with long guy lines and line runners. 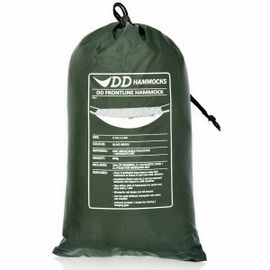 In addition to this, the stuff bag is cleverly integrated into the tarp itself, both saving weight and allowing quicker deployment and repacking. When used in conjunction with the Hilleberg Bivanorak, you get remarkable weather protection at an incredibly low weight. 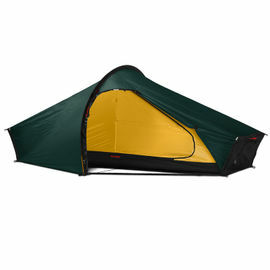 Hilleberg Tarp XP 10 is rated 5/5 based on 5 customer reviews. Great quality, good size, no complaints. The cord is easy to work with, it's a good thickness and has plenty of length. If you wanted to save weight you could change this. For me its fine . Pricey for what it is, but it’s a quality tarp. Light, well shaped and good attention to detail. Don’t forget to budget for some poles to go with it. So far I've only mucked around with this in my garden, but it's high quality and has great potential! Super fast and friendly service too. The tarpaulin is simple in concept and well made. The integrated bag for storing and carrying the material works well in practice, as packing is easily and quickly done. The guy lines are strong and generously long. My example was supplied with eight lines, one for each eye. The runners, which are manufactured by Line-Lok, seem to work very well in practice. When the tarpaulin is supported by poles, the poles tend to interfere with the lines at the eyes where they meet. As a result, line adjustment becomes more difficult. Provided that the poles are equipped with line eyes of their own (like the separately available Hilleberg Tarp poles), the lines can be transferred to those eyes, and then easy adjustment is recovered. In situations where the camp site is subjected to strong winds, it is straight forward to attach additional guy lines, and thereby increase overall stability. Excellent quality tarp that can sleep 2 people easily. I also have the XP20 that can sleep 5 or 6 people comfortably. Good, reliable and fast international shipping at a good price.